There are more insights tools available for free online than most people know about. In this post I list 12 of my favorite ones from Google and go a bit deeper into one of them. Below is a list of the 12 tools including a short description and link to each tool. Other data sources have other benefits, but these are the biggest benefits of search data from Google on which several of below tools are built. Do consumers find Brand A or Brand B more interesting? When is the seasonal peak for Industry A? Is Brand B more popular in Sweden or in Norway? Where in Sweden is the consumer interest highest for Industry A? What are the consumers searching for related to Industry A and how has that changed during the last week? What is the most popular search term on YouTube last month? What questions are people asking related to Industry A? So, lots of questions can be answered. 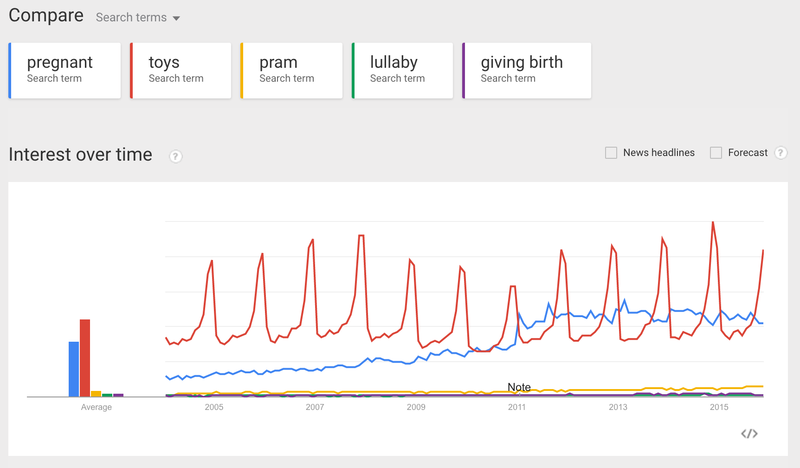 Google trends shows normalized query trends. If the search data was not normalized, regions with the most search volume would always be ranked highest. Normalized data means that sets of search data are divided by a common variable, like total searches. So if a search trend goes up, it really goes up, it’s not just because people have been searching more in general. As you see in this example toys peaks during Christmas (no surprise), but what perhaps is a surprise is that pregnancy dwarfs everything else linked to this category. So if to develop relevant content linked to your webshop for new parents, pregnancy-related content should probably be at the top of the list. As a next step you can look at what the main topics are linked to pregnancy that people look for, what is trending etc. Like in below case it’s clear that the fastest rising area among the major areas is linked to the week of pregnancy you’re in. So from a relevance point-of-view, the first content you should probably look at developing is the best pregnancy calendar out there. That took less than 3 minutes to find out. You can use Google Trends to continue dive into the behavior of people linked to your industry, and there are many functions in Google Trends that you’ll learn to use once you get started. And that’s the most important thing when it comes to using online data for insights… getting started. So as a next step, take a look at below list of free insights tools and start playing around with them. Keep it simple, think BIG and have fun!